With over 1.5 billion blogs on the internet today, companies must consistently create engaging content to stand out amongst competitors, differentiate their brand, and interact with both existing and prospective customers. Studies have shown that blogging generates 55 percent more website visitors and also elevates brand awareness. Seventy percent of consumers actually learn about an event or company news through articles rather than ads. While developing creative content is necessary to draw in website visitors, it isn’t the only important factor to consider when blogging. To drive the most traffic to blog posts, search engine optimization (SEO) is key. Since Google and other search engines use advanced algorithms to understand and rank pages appropriately, SEO is a series of methods to increase website traffic through content relevancy and authority. Therefore, content must not only be engaging – it must also be categorized and described accurately with tags, internal hyperlinks, meta descriptions, focus keywords, and other “under the hood” settings. Categories are meant for the broad grouping of your blog posts. Think of these as general topics or the table of contents for your site. Categories identify what your blog is really about and also assist readers as they navigate through various content on your website. For example, this blog post is listed under the “content” and “marketing” categories on our website. Search engines assign each page on your website a score, which increases page authority. Since the most common signals of authority are links, make it a habit to crosslink at least one piece of content from your website (a previous blog post, video, white paper, or infographic) in each blog post.​ This will help boost page views, increase the time users spend on your website, and will improve your overall SEO score. A SEO plugin such as Yoast helps to organize the meta information and search criteria of blog posts, thus optimizing your website for search engines.​ When writing a new blog post or creating a new page, the Yoast plugin provides an automatic SEO and readability analysis. 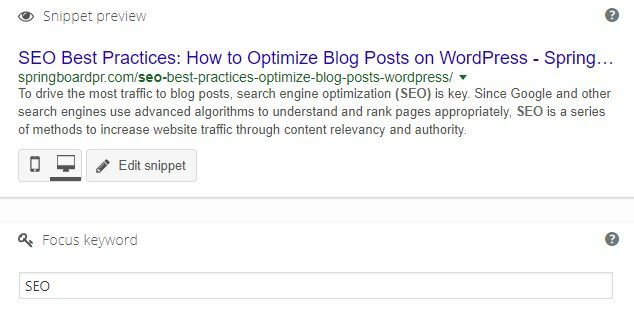 Within the Yoast plugin, a focus keyword must be chosen as the main search term or phrase that will lead people to your blog post. This focus keyword should be in your blog post title as well as the beginning of the first paragraph. As blog posts with images receive 94 percent more total views, at least one image should be included in every blog post. To optimize images, alt tags and title tags should be unique and identify with your blog post topic. It’s also important to include your focus keyword in the alt text so that Google can relate the image to your blog post in search results. Google uses click-through-rates as a way of determining whether a page is a good search result. The more people click your page, the higher your page will be moved up in search results. Meta description, a snippet that summarizes a page’s content, is great for generating more click-throughs from search engines. To optimize your meta description, write in active voice, include a call to action, use your focus keyword and include text variations. Overall, search engine optimization increases website visibility, traffic, and engagement. Good SEO practices also improve the user experience and usability of a website.​ A SEO plugin such as Yoast can successfully optimize WordPress websites for search engines and ultimately drive a broader audience to your blog posts. Interested in improving your company's SEO and marketing strategies?